Terrorists struck again in Doda this morning when they exploded a grenade on a procession of the Hindus resulting in the death of two and injury to 41 persons. Those killed have been identified as Bharat Bhushan and Munshi Ram. 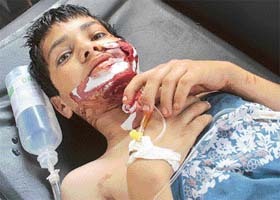 Javed, a boy injured in the Doda blast, is seen lying in an ambulance at the Air Force Station in Jammu on Saturday. 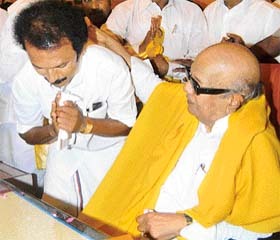 Tamil Nadu Chief Minister M. Karunanidhi today announced a series of sops including waiver of cooperative loans of farmers up to March 31, 2006, to the tune of Rs 6,866 crore and reduction of the price of rice, supplied through the public distribution system, from Rs 3.50 to Rs 2 per kg, fulfilling the DMK’s two major poll pledges. Mr M.K. Stalin takes the blessings of his father M. Karunanidhi at the secretariat following the swearing-in ceremony, in Chennai on Saturday. Four persons were arrested from Malegaon in Nasik district today in connection with the arms seizure from suspected Lashkar-e-Toiba militants in Aurangabad even as the Anti-Terror Squad in Mumbai on Saturday recovered another haul of arms, including a box load of RDX, one AK 47 assault rifle and several rounds of ammunition on the outskirts of Nasik city. Passengers travelling in the Delhi-Kalka Shatabdi had a narrow escape this morning when one of the coaches caught fire. No one was reportedly injured. The incident happened when the train was on the Shahabad-Markanda stretch and was running at a speed of more than 100 km an hour. The monsoon appears to be on time this year. This is what is being indicated by the Indian weather forecast system, which is showing signs of the monsoon in the country to be almost on time and not much delayed. The normal onset of monsoon is around June 1. A man in Rajasthan has got both his daughters married to the same bridegroom even though it amounts to bigamy, saying it will ensure care for the elder girl who is mentally challenged. Home-made chopper for Rs 1 lakh ! A vegetable seller in an Uttar Pradesh village has developed a two-seater "homemade helicopter", which if approved will be made available for just Rs.100,000, claims an association of innovators here. According to the National Innovation Foundation, 24-year-old Mustakeem Ali from Ratool village in Baghpat, Uttar Pradesh, has made the helicopter with help from friends and other vegetable sellers.